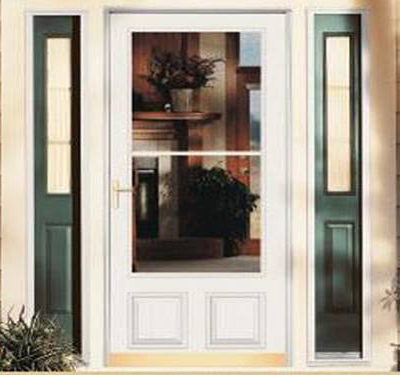 Need a New Storm Door? Weatherproof is concerned with today's energy conservation efforts. That is why Weatherproof manufactures quality aluminum storm doors to fit all needs. Weatherproof is also know for its reliability. Weatherproof has been satisfying their customers' needs since 1956, so you can be assured of Weatherproof's dependability to deliver a quality product on time. Request your Free Estimate for a New Storm Door! Weatherproof backs their product with a full guarantee against defects in workmanship and materials! Weatherproof's products are not only functional, they enhance your home's appearance and value. When you get right down to it, installing Weatherproof products does not cost... it pays! Odd Sizes are no problem! Each one of Weatherproof's products is custom made, one at a time, to fit your individual requirements.